Last weekend, I popped down to the inaugural Empire Big Screen event at The O2 in London. Unfortunately, I didn't expect to procure a last minute press pass so I was at my day job for much of the weekend. Oops. 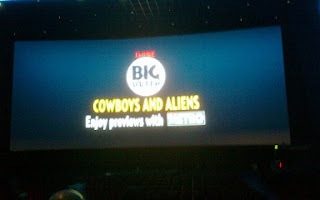 Read on for some thoughts on Day 1 of the Empire Big Screen event, including a brief review of 'Cowboys & Aliens'. As I mentioned a few words back, I was working for much of the weekend so that meant I had to dash across London to get into the press room before it shut on Friday evening. I just about made it. After that I felt like I was back at Glastonbury Festival, where I had little idea of where I was going or what I was doing. Except The 02 is thankfully much, much smaller. I was pretty gutted to miss the screening of the 'Rise Of The Planet Of The Apes', the new prequel which I hear is very good. But I still cannot understand how a group of apes, no matter how unfeasibly smart, can defeat six billion humans. It's simple maths isn't it? I guess I'll have to pay to find out. There was also a panel showcasing the behind the scenes footage of WETA's special effects on the film - which would have fit in nicely with our history of CG characters. Other interesting-sounding panels included Tom Six discussing the censorship of his new film 'The Human Centipede 2' and 'Watchmen' illustrator Dave Gibbons talking about his body of work. By the time I arrived, I only had two choices: 'Cowboys & Aliens' or the new Kevin Smith film 'Red State'. Horror's not my thing and I'm not sure it's Kevin's either so I elected to try to watch the rather ridiculous sounding new release from Jon Favreau, the director of 'Iron Man', instead. This was my first experience of the befuddling queuing system whereby everyone was asked to queue outside. I don't just mean outside the cinema, I mean literally outside. Luckily, the staff just let me head into the cinema seeing as I was on my lonesome. The confusion didn't stop there though as after a few minutes of trailers, the house lights came up again and we were made to wait. Again. Some of those trailers looked very good admittedly, although there was a slight issue in that if you'd been to see showcases earlier in the day, you'd probably be sitting through exactly the same thing you'd seen just hours before. I didn't mind so much and seeing the new trailer for 'The Girl With The Dragon Tattoo' remake on something other than my laptop screen made me quite excited. The film itself was something of a disappointment. 'Cowboys & Aliens' is a name that screams excitement but this was a film whose concept proved more interesting than its execution. It has its moments but there is little emotional investment in likes of the unexpectedly gruff Harrison Ford and strong, silent Daniel Craig. It might be a unique mash up of the two genres but forgets to be good at either. I'll be reviewing the film at greater length soon but in the meantime, spend your pennies elsewhere, say 'Super 8' or 'Captain America: The First Avenger'. Or wait till Friday, and the brilliant new release 'The Guard', which I'll be talking more about in the Day 2 review of Empire Big Screen 2011. I'm sure you're weeing yourself with anticipation. Read more on the event at empirebigscreen.com.